Energy safety will be at the forefront of canteens across the state with the launch of the 2019 Energy Safe Victoria (ESV) Canteen Grants. Often the hub of any sporting club and a big source of income, many canteens are relying on old and often dangerous electrical and gas appliances. ESV with the support of AFL Victoria will offer these canteens the chance to become energy safety ambassadors. In return, ESV will match dollar for dollar (up to $1,000) for the purchase of new electrical or gas equipment. As an ambassador canteen, ESV’s all-important energy safety messages will be displayed on the menu board, canteen counter, corflutes on either side of the canteen window and a ‘canteen now open’ A-frame. 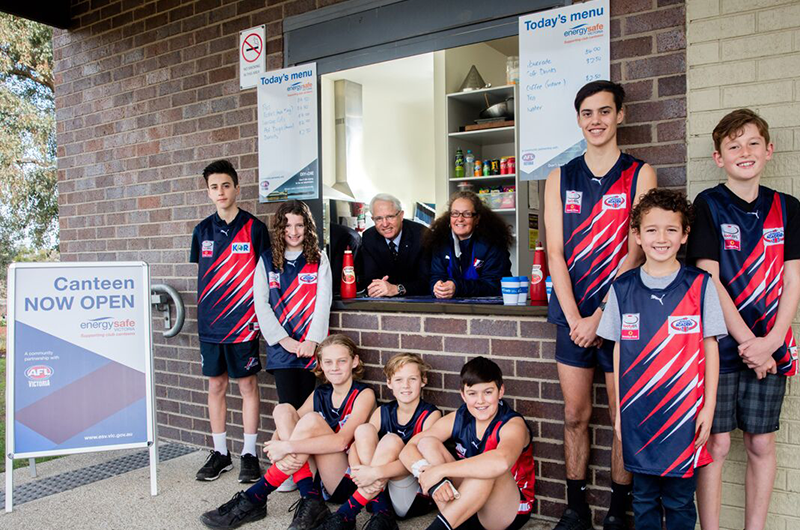 “ESV is proud to be behind a program that invests in the community by ensuring all those volunteers working behind the counter at footy and netball canteens are safe,” Director of Energy Safety Paul Fearon said. “These volunteers are the lifeblood of their club and they deserve new and efficient appliances to support them in their work. Household wiring: avoiding the risk of house fire by having household wiring regularly checked and having a safety switch installed. ESV Canteen Grants supported 27 canteens across the state in 2018.
a pie warmer that was purchased second-hand in the 1980s. The 2018 ambassador canteens were chosen based on their contribution to the community. The grants are spread as equally as possible across the state. The structure of the grants has changed in 2019 so there are more available. ESV will match funding up to $1000. However, if there are genuine hardship circumstances, there will be no match funding requirement and ESV will fund a grant of up to $1000.